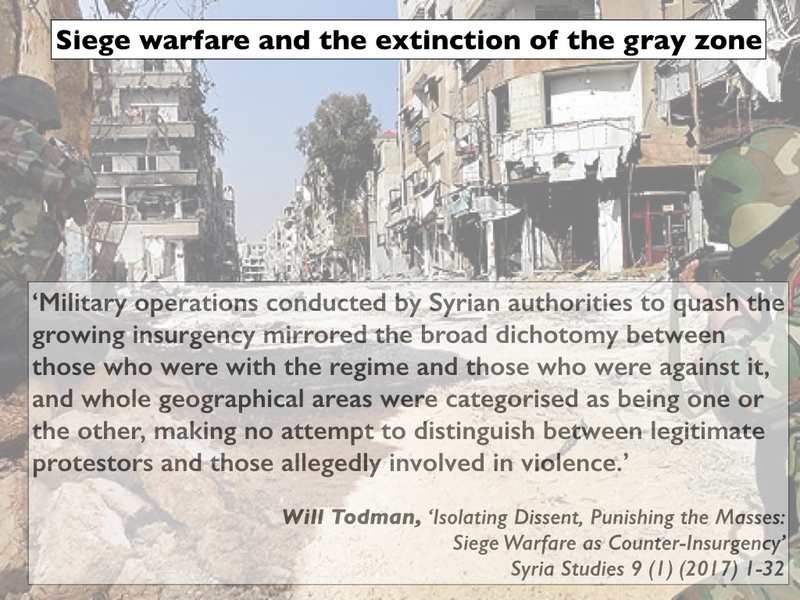 In this second post on Cities under siege I provide a back-story to the re-intensification of military and paramilitary violence against civilians in Syria I described here. 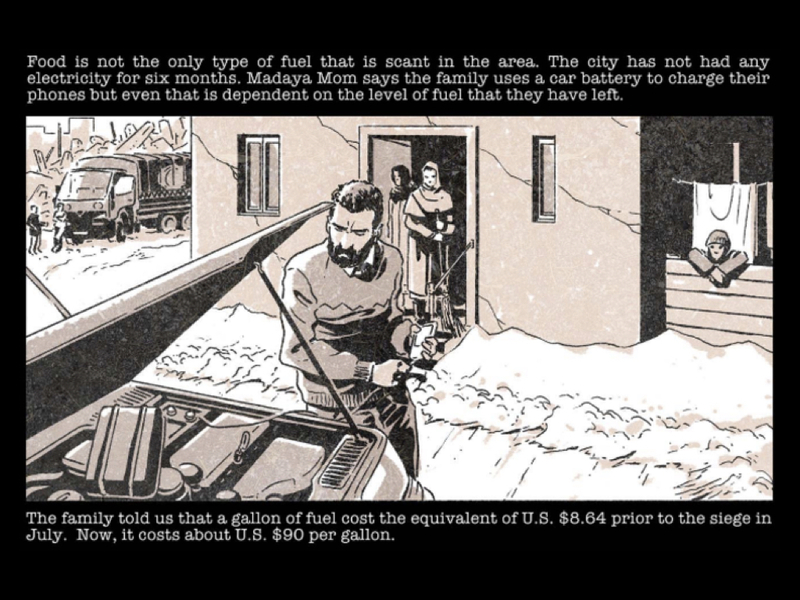 But it’s also a back-story to the stunning image above, ‘Deluge’ by Imranovi: people were evacuated to what eventually became nominally ‘de-escalation zones’ from besieged cities like Aleppo, but many more continued to flee Syria altogether – like Imranovi himself (more on Imranovi here and here). 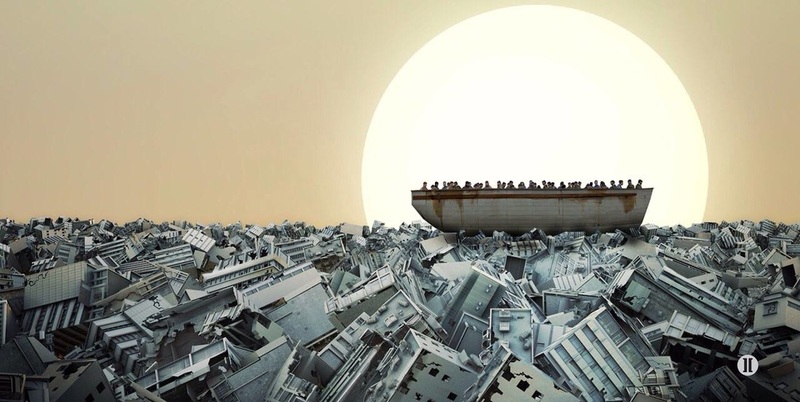 It’s worth pausing over his artwork: every time we see video of those perilous boats crammed with desperate refugees we ought to reflect on the oceans of bloody rubble strewn across their land and the millions of other displaced people in their wake. The capture of besieged towns on the south and eastern sides of Eastern Ghouta had a negative impact on conditions throughout the entire besieged region. IDPs from the frontline areas fled into host communities that have also been subjected to the same long-term siege and lack the infrastructure and resources to support the newly displaced families. There is now a higher concentration of people living in temporary shelters or sleeping on the streets. 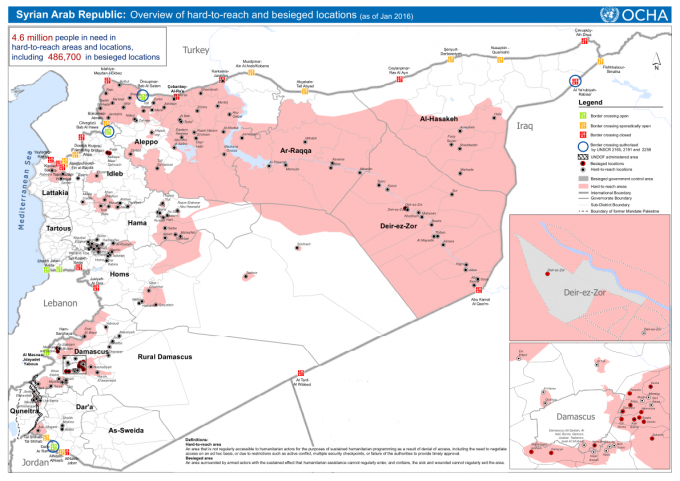 From its base at the five-star Four Seasons Hotel in Damascus, OCHA decided that an area is merely “hard to reach” rather than besieged if it has received an aid convoy in the last three months, regardless of whether the supplies are sufficient for one month, let alone three. One doesn’t need to travel far from Damascus to see how little a distinction there often is between a “hard to reach” and a “besieged” area. 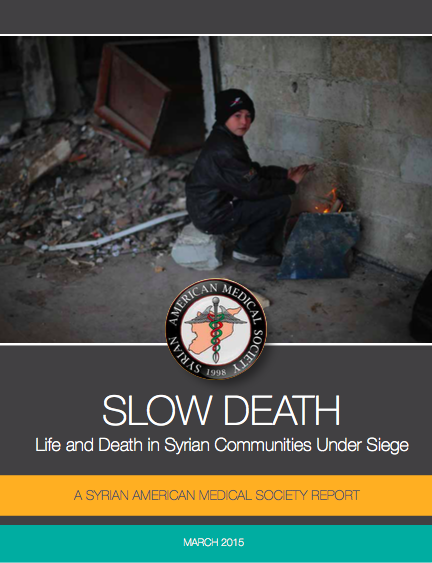 Even those attenuated maps are alarming enough, but the Syrian American Medical Society (SAMS) also believes that the OCHA reports systematically under-report the magnitude of the crisis, and in Slow Death: Life and Dearth in Syrian communities under siege (March 2015) they provided a more sensitive three-tier classification. Like Annie, I have been impressed by the work of Siege Watch and so I’ll start with their regular reports that have provided a series of powerful insights into the effects of sieges on everyday life. In their first report they identified characteristics shared by all communities besieged by the Syrian government. When that report was compiled almost 50 communities were besieged; only two of them were under siege by forces other than the Syrian government and a third was besieged on one side by the Syrian government and on the other by Islamic State. Siege Watch notes how, in consequence, ordinary people have ‘adjusted’ to these new, bleak realities: ‘Creative survival tactics such as rooftop gardening [below: eastern Aleppo], burning plastic to extract oil derivatives, and the local production of some basic medical supplies have become more common over time, and people have begun to acclimatise to a more primitive lifestyle’ [see also here]. That’s an important qualification, but it plainly doesn’t erase the struggles of civilians either – which makes ‘acclimatisation’ a remarkably weak term to describe the multiple, extraordinary ways in which civilians have been forced to adjust to a new, terrifyingly abnormal ‘normal’ in order to survive. 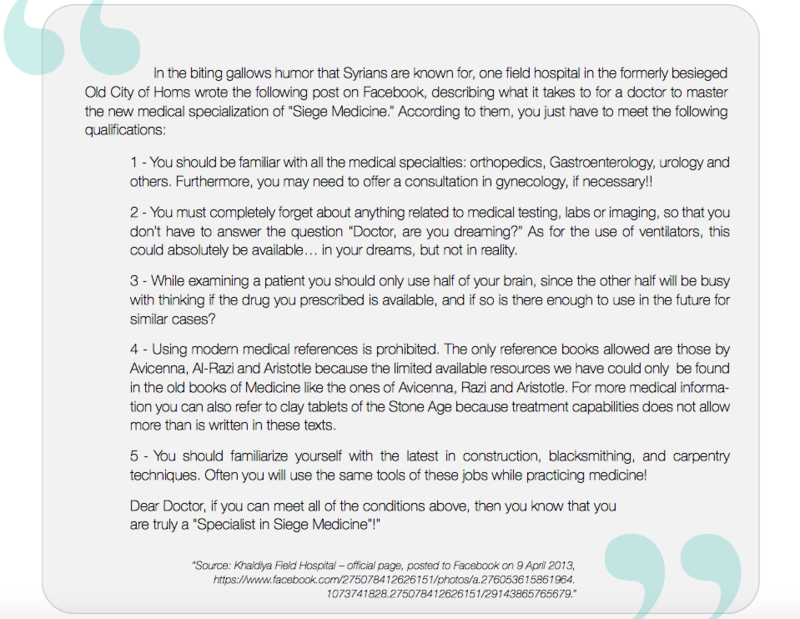 Here, for example, is a doctor in Homs describing ‘Siege Medicine’ [more here]: The Center for Civilians in Conflict has also provided a report on civilian survival strategies that lists a series of other extraordinary, collective measures (and the title, Waiting for No One, says it all). 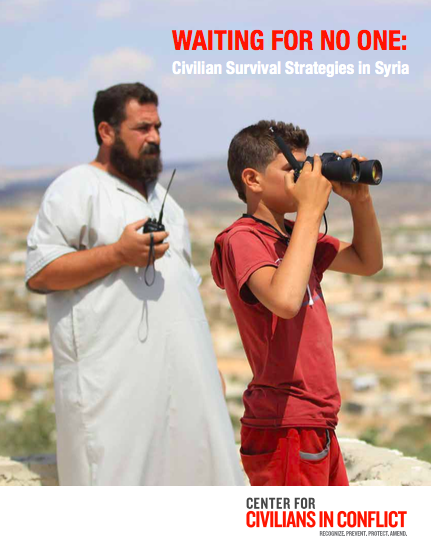 These strategies include the provision of makeshift early warning systems against incoming air attacks (spotter networks, radios and sirens); the provision and protection of medical infrastructure (in part through improvised field hospitals and the construction of underground hospitals); and the development of local aid and rescue teams (including the Syrian Civil Defence or White Helmets); protection from unexploded ordnance (‘the armed groups typically harvest them for their own makeshift weapons’ but the White Helmets and other groups have sought to render them harmless). But Siege Watch – and José and Brent – have in mind something more: something in addition to strategies that are necessarily but none the less intimately related to direct, explosive and often catastrophic violence. They also want to emphasise the ways in which otherwise ordinary, everyday activities have been compromised and ultimately transformed by siege warfare. In a dark kitchen, by the flickering light of a single safety candle, two men bundled in hats and jackets against the cold put on an impromptu video satire: live from Yarmouk, at the southernmost edge of Damascus, a cooking show for people under siege. “This is the new dish in the camp of Yarmouk. It hasn’t even hit the market yet,” said the man on the right, 40-year-old Firas Naji, the blunt and humorous host. He picked up a foot-long paddle of sobara, Arabic for prickly pear cactus. Holding it carefully by one end to avoid thorns, he displayed first one side and then the other for the camera. 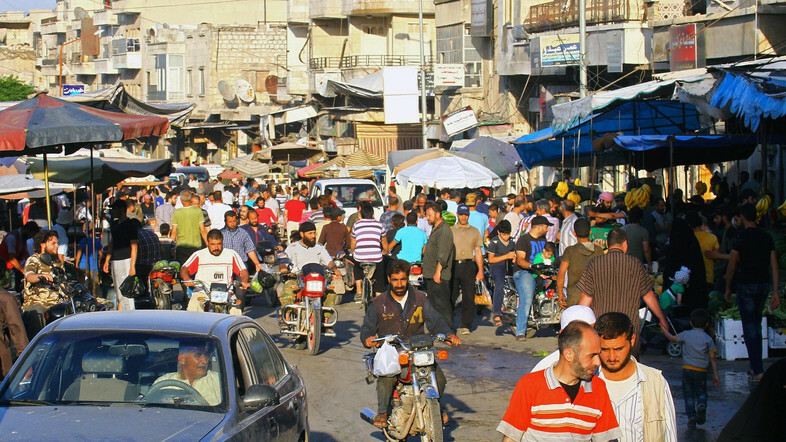 The government checkpoints in and out of Yarmouk would close for four days, then five, then six. Soldiers would confiscate any amount of food over a kilo…. 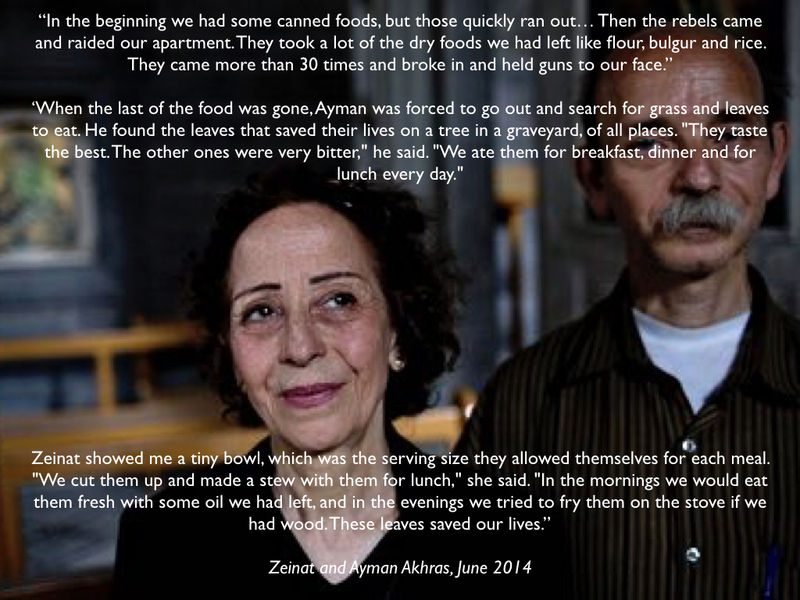 On July 21, 2013, the regime closed the main checkpoint into Yarmouk for good. The siege was total: Nobody could leave, and nothing could enter except what the soldiers permitted. Over the next six months, the price of everything went up. A single radish reached $1.50 at one point; a kilo of rice was $100. 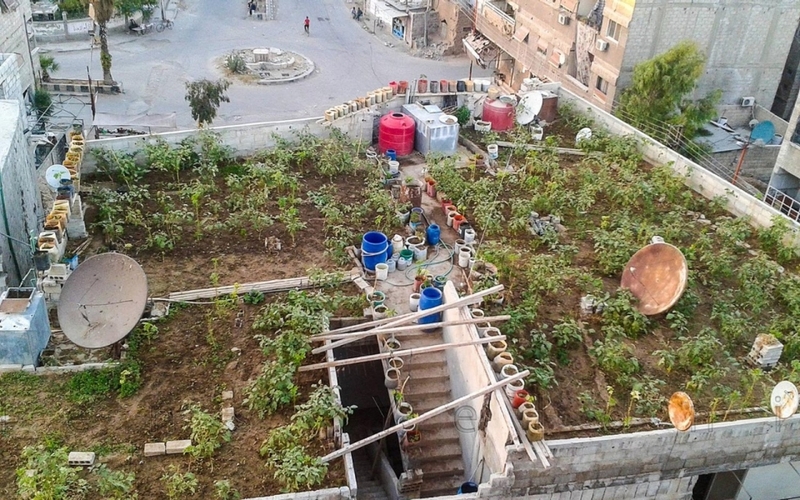 Between buildings, in abandoned lots and on rooftops, the siege gardeners of Yarmouk have been cultivating everything from eggplants to mulukhiyeh, a jute plant whose glossy leaves make a rich green stew. Come harvest time, they bag the produce into 1-kilo portions, hang the bags on the handlebars of beat-up bicycles and pedal around the camp distributing the food to their neighbors. They focus on those most in danger of starving: children, poor people and the elderly. 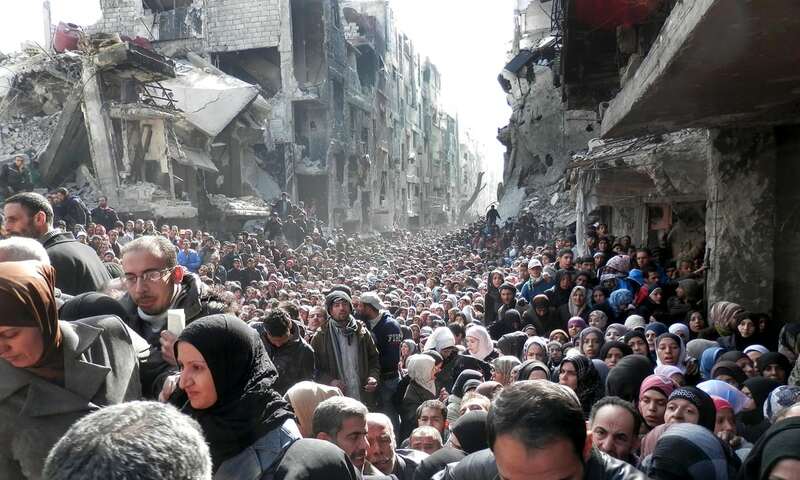 But the situation was much bleaker than the picture conjured up by that paragraph; the siege waxed and waned, and UNRWA was occasionally granted permission to deliver emergency relief, but the image below – of residents queuing for food supplies – shows how desperate the situation became. There was no anger or hysteria in her voice, just a calm recollection of facts. “You couldn’t buy bread. At the worst point a kilo of rice cost 12,000 Syrian pounds (£41), now it is 800 pounds (£2.75) compared to 100 Syrian pounds (34p) in central Damascus. It was 900 pounds (£3.10) for a kilo of tomatoes, compared to 100 here,” Reem recalled. “We had some stocks but when they gave out we used to eat wild plants. We picked and cooked them. In every family there was hepatitis because of a lack of sugar. The water was dirty. People had fevers. Your joints and bones felt stiff. My middle daughter had brucellosis and there was no medication,” she said. In October 2013, in a sign of how bad things had become, the imam of Yarmouk’s largest mosque issued a fatwa that permitted people to eat cats, dogs and donkeys. Control of Yarmouk see-sawed between the Syrian Arab Army, Al-Nusrah and Islamic State, with thousands of civilians trapped behind the siege lines so that time and time again the community was thrown back on its own, desperately strained resources to survive. The youth then moved on to mockingly give his viewers advice on how to lose weight. “Would you like to lose weight? Green tea won’t work, nor will ginger … just come to Yarmouk camp for five months, in each month you’ll lose 9kg,” he said, adding the Arabic proverb: “Ask someone with experience instead of asking a doctor.” … “We ask the troublesome channels that claim Yarmouk camp is under siege to stop reporting that. It is ‘absolutely’ [said in English] not true,” one said. “It’s true that my grandmother died of hunger but not because the camp was under siege but because my grandfather was so stingy – he never allowed her near the fridge,” he added. The examples can be multiplied many times over, but in a way this last testimony is exceptional – amongst those on which I’m drawing, at any rate – because it only became available once the siege had been lifted. Those videos from Yarmouk point towards something different: the possibility of breaching siege lines through digital media. So let me turn to Madaya, a town in the Qalamoun Mountains 45 km north-west of Damascus and once famous for its fruits and vegetables. It came under siege from the Syrian Arab Army and Hezbollah militias in July 2015: the town was encircled by 65 sniper-controlled checkpoints (below) and its surrounding countryside sown with thousands of landmines. Every day I wake up and start searching for food. I lost a lot of weight, I look like a skeleton covered only in skin. Every day, I feel that I will faint and not wake up again… I have a wife and three children. We eat once every two days to make sure that whatever we buy doesn’t run out. On other days, we have water and salt and sometimes the leaves from trees. Sometimes organizations distribute food they have bought from suppliers, but they cannot cover the needs of all the people. 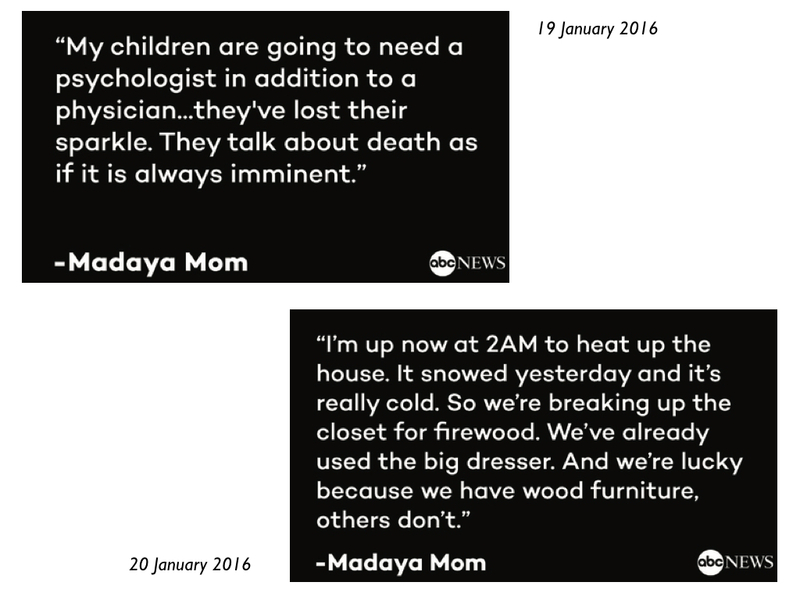 In Madaya, you see walking skeletons. The children are always crying. We have many people with chronic diseases. Some told me that they go every day to the checkpoints, asking to leave, but the government won’t allow them out. We have only one field hospital, just one room, but they don’t have any medical equipment or supplies. I’ve described that field hospital before, but Mohammad‘s testimony reminds us that war produces not only catastrophic injuries; it also produces and intensifies chronic illnesses that a protracted siege eventually renders untreatable. 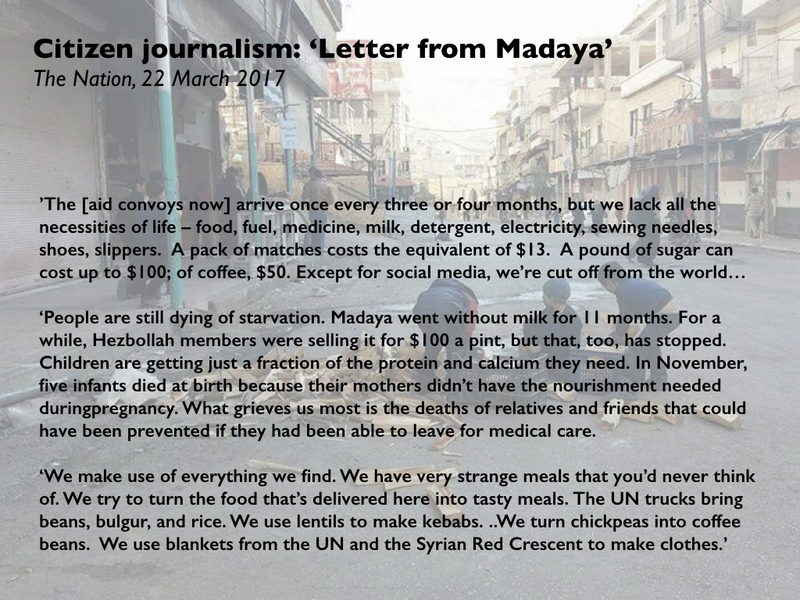 (The Syrian American Medical Society issued a report, Madaya: Starvation under Siege, which you can read here). 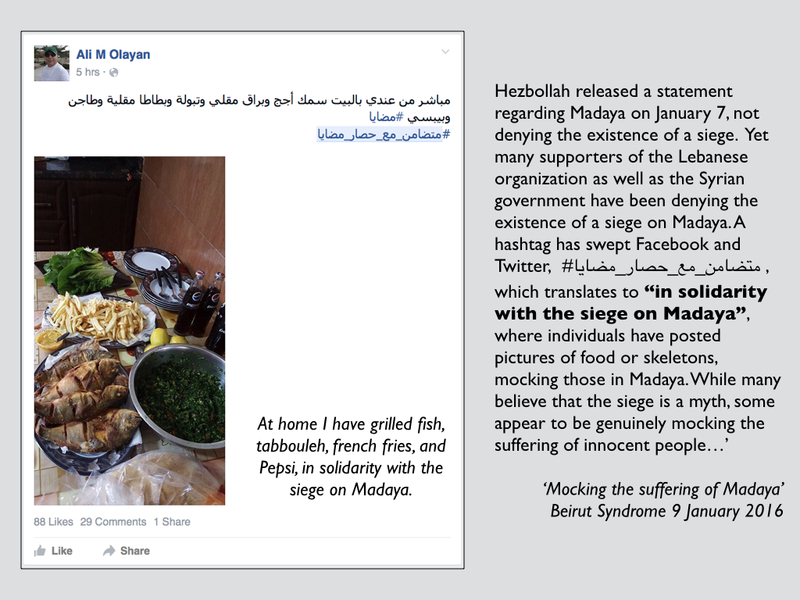 Two days later there were reports of a different digital satire: one that denied the existence of a siege in Madaya and mocked its victims. We communicate through secure messaging apps over the phones, over the internet really. So the way we went about finding her was to go through a wide network of sources that we’ve cultivated over the years of covering the war in Syria. We had to work for a few weeks, I have to say, to identify the right person and then to get in touch with her and to gain her trust in order for her to feel comfortable enough to engage in this conversation with us because she felt and her family felt that it might put her in danger. 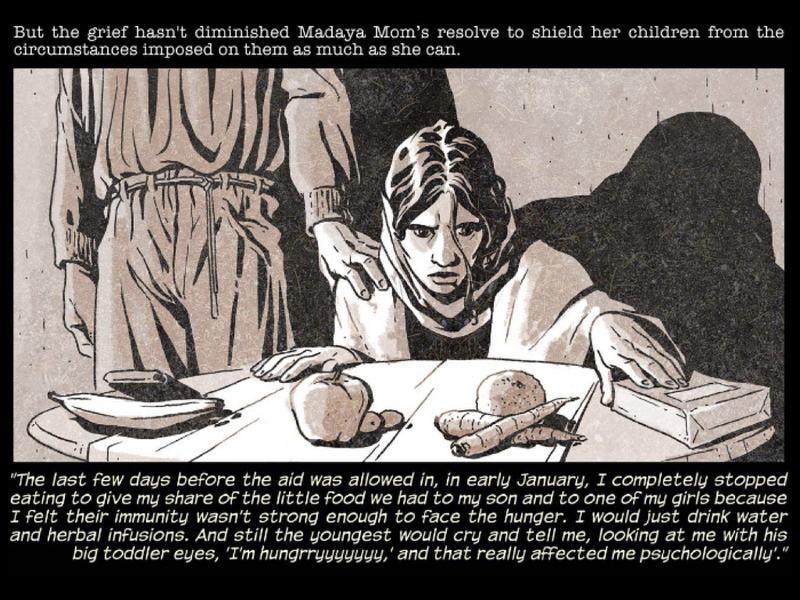 Working with Marvel Comics, ABC transformed her story into a free digital comic: Madaya Mom. The most striking parts is for me the most intimate ones as she – for instance, she decides to even though they are – they’re all starving, she decides to stop eating herself because this little amounts of supplies and food that she has, she distributes it to her children and of course husband. And she herself just stopped eating. And it’s not like a dramatic decision. It’s, like, a logical thing to do. These are the moments that stick with me most. And it is through the assault on the intimacies of everyday life – on something as vital as feeding one’s family – that siege warfare is at its most vicious. 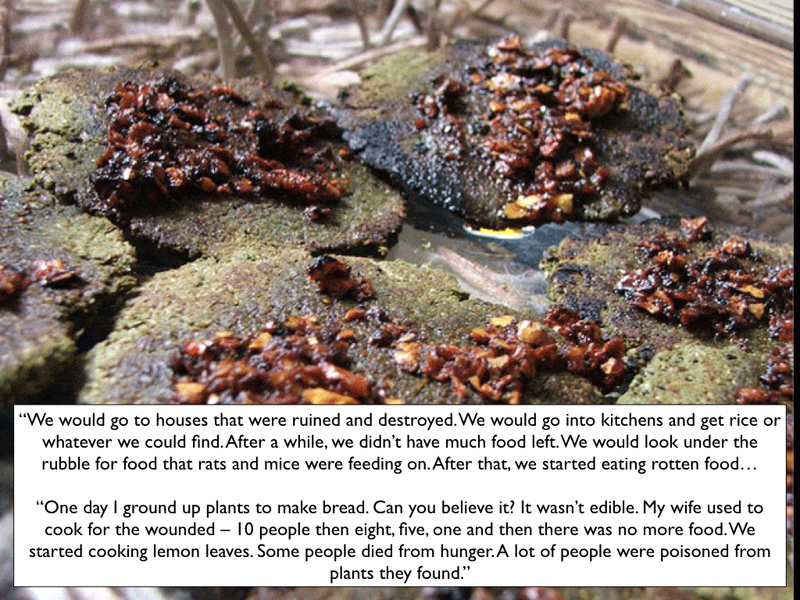 Parents whose children had stopped eating because their bodies could no longer tolerate only rice and beans. Children who could no longer walk straight because of the lack of Vitamin D and micronutrients that had riddled their bones with rickets, or who had stopped growing entirely, stunted from lack of essential vitamins. One mother showed us her baby’s bottle filled with rice water – the teat so worn it had to be sewn back to together. “Look at what I am feeding my child” she said. Almost everyone we spoke to asked for protein – meat, eggs, milk, vegetables – something more to sustain themselves than the dry goods that were available. One mother explained that every time her child now smells boiled burgal, she starts to cry. The doctor reported an increase in miscarriages, 10 cases in the last 6 months, because of the nutritional status of mothers. Over the last year alone, he has had to perform over 60 caesarian sections. This number was unheard of before the crisis, she told us But women no longer have the strength for childbirth, and many pregnancies go over term, again because of the poor health of pregnant women. That video [above] was aired around the world by Reuters and Al Jazeera. The accusations enraged Abdulrahman. 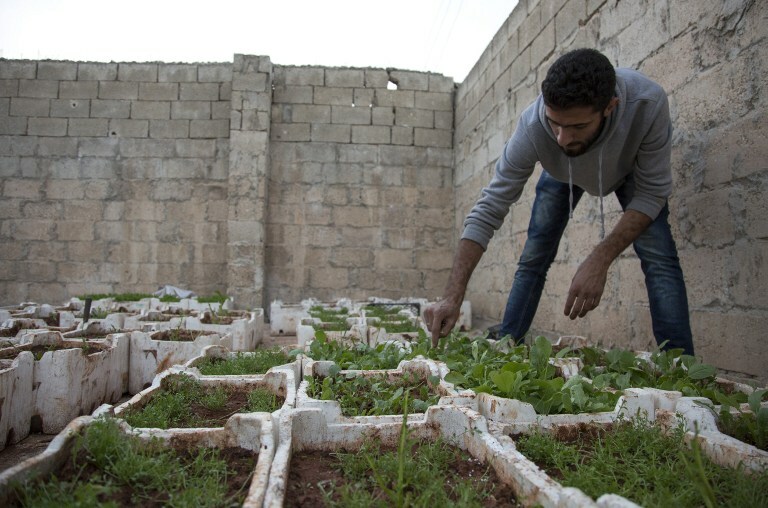 “When Madaya goes hungry, we go hungry,” he says. 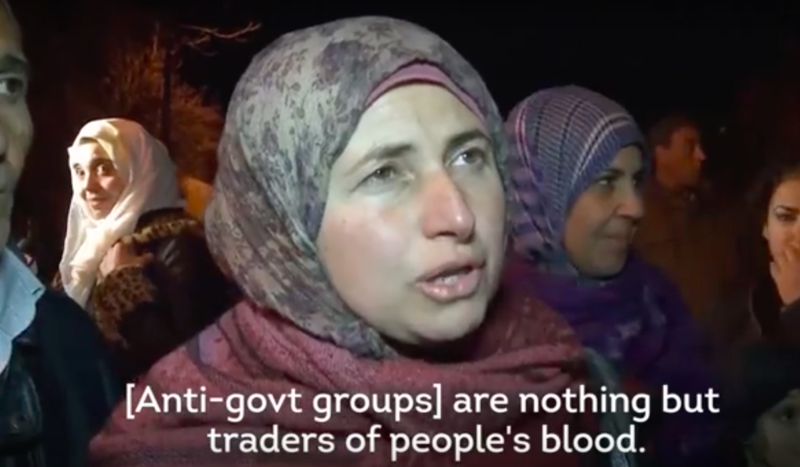 “These are vicious lies.” VICE News spoke with another woman who claimed to be at the barricades that day. 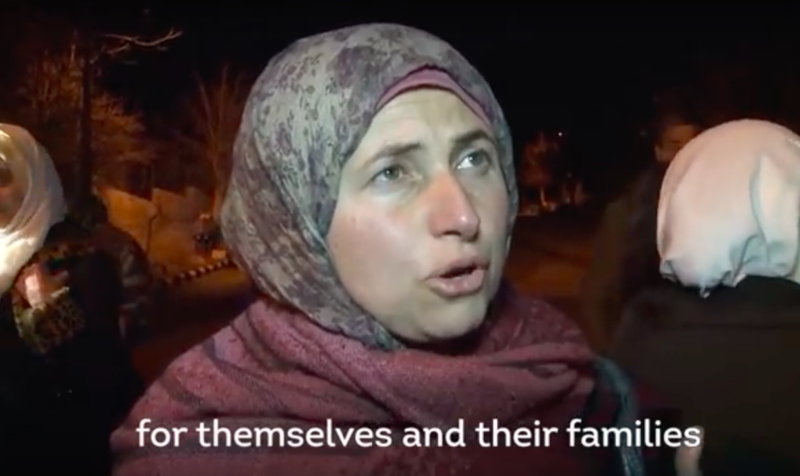 Although it was impossible to verify her claims, she said that Hezbollah fighters — who can be seen in the video frame — told women to condemn the rebels and praise Assad in exchange for food and safe passage from the town. In a press release from early January, Hezbollah also accused Abdulrahman of profiteering. 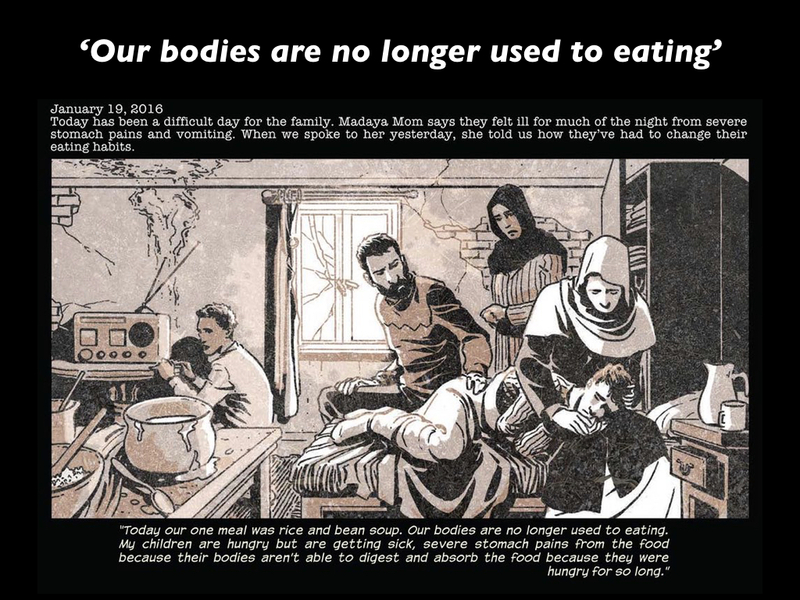 “Armed groups in Madaya control food supplies within the town and sell to whoever can afford it,” the statement read, “Thus, starvation is widespread among poor civilians.” VICE News spoke to a Hezbollah commander stationed outside Madaya who repeated these claims, and said that Hezbollah has been sending food inside the town. The rebels, he said, are keeping it for themselves. He also strongly denied that Hezbollah was trading food for propaganda. 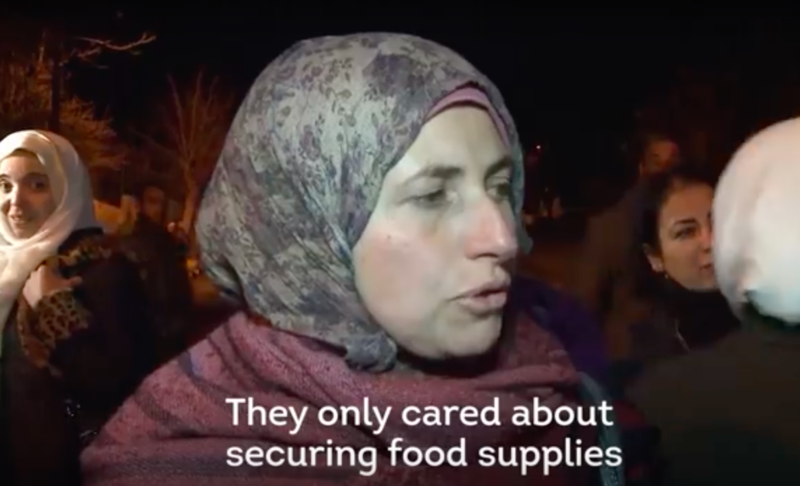 VICE News also spoke with aid workers at the Doctors Without Borders-affiliated field hospital in Madaya, who reported no interference from Abdulrahman’s men in the dispensation of aid. For further, still more shocking twists on the story, see here and a response here. It’s difficult to adjudicate these competing claims in the face of skilfully organised propaganda campaigns (in which the alt.left is often as grotesque as the alt.right), but wherever the truth lies, it is clear that food has been consistently transformed into a weapon of war (‘surrender or starve‘) – a crime expressly forbidden by international humanitarian law (see also here) – and that 40,000 civilians inside Madaya were trapped in the midst of the battle. In my previous post on this subject, I described all this as the back-story to the carnage now taking place in Idlib, in eastern Ghouta and elsewhere, but it is of course only one back-story: there are many more. Still, on 14 April 2017 under the ‘Four Towns Agreement’ a fleet of sixty buses transported several thousand people, rebels and civilians, from Madaya – to Idlib. If we leave, we’re labeled terrorists and we go to Idlib where the chemical attack happened last week; and if we stay we don’t know how the government will treat us. I was surprised. I saw markets [below, June 2017], people walking in the streets; there is electricity, internet, ice cream and food – things we did not have in Madaya. 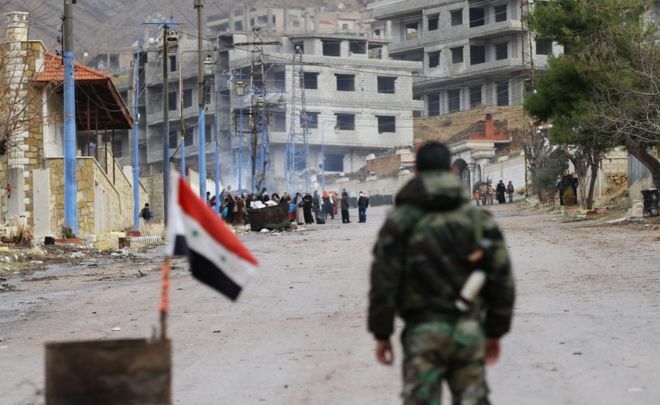 Madaya and Zabadani are destroyed. In Idlib, the destruction is not too bad. There are a lot of cars and I was really surprised to see cars. I felt like the little children that came from Madaya to Idlib: they were surprised when they saw a banana, a cherry, biscuits or chocolate. They have never seen that before. It sounds stupid, but I felt a little bit the same when I saw cars again. I can eat everything. The first thing I ate was fried chicken and it was great. And I have had a lot of chocolate, too. 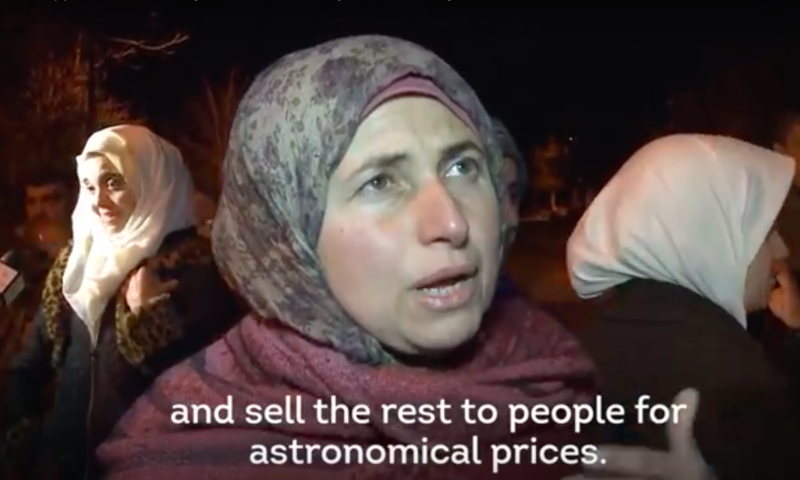 But in general, Idlib is a poor city… I started to search for jobs, but there are almost no jobs here. Idlib is like a big prison. It’s like Gaza. 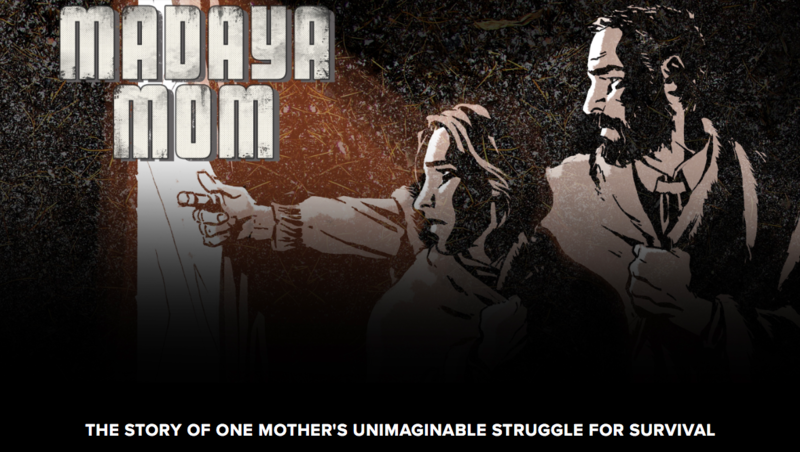 It’s like Madaya, but a big Madaya. So we are imprisoned here. 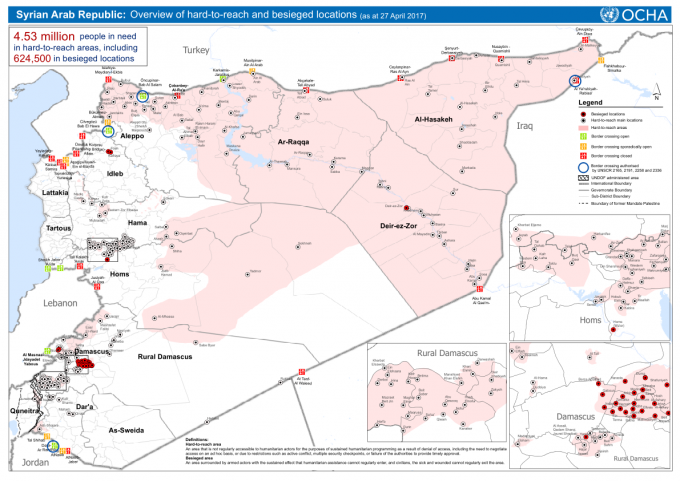 Movement was unrestricted within Madaya. For movement in and out of the area, two access points have been used since the implementation of the Four Towns Agreement. In September, 26-50% of the population were reportedly able to use formal access points providing they showed identi cation. However, men reportedly did not feel safe using the access points, fearing conscription and detention when crossing, while both men and women reported verbal harassment. Since May 2017, commercial vehicle access has been permitted to the area. However, access restrictions on vehicle entry continued to be reported in September and included documentation requirements, confiscation of loads, required fees and limited entry depending on the day or time. Humanitarian vehicle entry has reportedly not been permitted for the past six months. 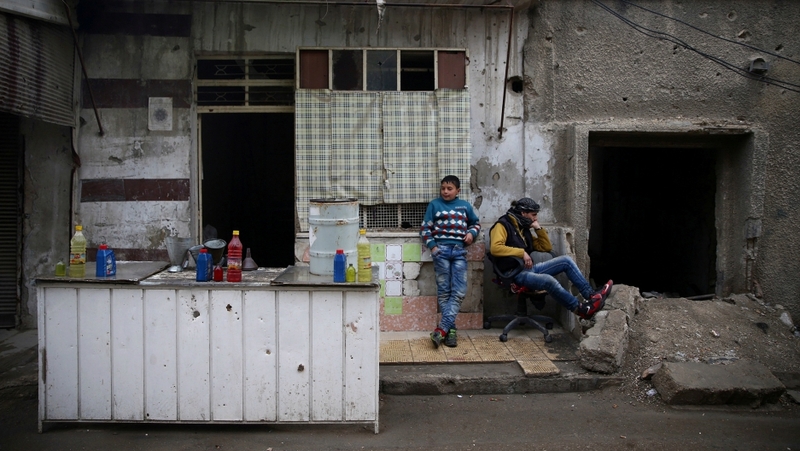 The cost of a standard food basket in Madaya has remained stable since May 2017, with the average cost around 12% more expensive than nearby communities not classi ed as besieged or hard-to-reach. Water continued to be insufficient and some residents reportedly reallocated money intended for other things to purchase water. Meanwhile, access to generators remained stable at 4-8 hours a day in all areas of the community. You need months before you die of starvation. The air strike attacks were a different story. You could die from a piece of shrapnel in a fraction of a second. Nobody was protected from the air strikes and shelling. Civilians, rebels, buildings, cars, bridges, trees, gardens etc. were all a target. And so one final digital satire. In April 2016 the Syrian government held elections and claimed that even opposition-held areas were enthusiastically participating. Responding to what they called ‘the theatrics of the Assad regime’, teenagers in Madaya posted a video of their own mock hustings: The rival candidates were “Deadly Starvation”, “Deadly Illness”, and “Airstrikes”. This entry was posted in biopolitics, casualties, cities, humanitarianism, late modern war, refugees, Syria and tagged Annie Sparrow, digital media, food security, Idlib, Madaya, malnutrition, siege warfare, Siege Watch, starvation, survival strategies, Syria, Syrian American Medical Society (SAMS), Yarmouk by Derek Gregory. Bookmark the permalink.